Edoardo Italia ’16 (Italy) applied to six schools—Imperial College London, McGill University, University of Manchester, University of Exeter, University of Birmingham, and Loughborough University—and received offers from all of them. He secured a spot at the world-renowned Imperial College London after posting a 40 on his International Baccalaureate exams. While he has a clear affinity for science and earned the Class of 2016’s Excellence in Science Award, Edoardo credits the depth of the TASIS academic program and the quality of the School’s teachers for turning him into the confident and well-rounded student he is today. 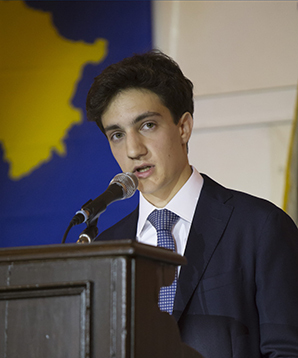 Edoardo also made the most of his time outside the classroom—playing Varsity Volleyball, performing in plays and musicals, making a Global Service trip to Cambodia, founding a Drama Club and a Science Quiz Bowl, and serving as a Dorm Proctor and an ambassador for the TASIS Leadership Academy. Headmaster Lyle Rigg took note of Edoardo’s enthusiasm and well-rounded excellence when he presented him with the coveted Headmaster’s Award, and Edoardo notes that these varied experiences have been every bit as meaningful as his academic accomplishments.